2. Why Connect the World? Enterprises today are faced with a dramatic challenge; there are billions of people connected to the Internet, they are using millions of applications, and the number of connected devices continues to soar. The real challenge is to ensure all of these are useful and productive for an organization or an individual. For this, they need to be connected in some form and ensure there’s various levels of connectedness that make sense for different kinds of devices and types of applications. This enables a connected world, which in turn promises real benefits to an enterprise from a business perspective. A connected world is even more relevant in today’s context given rapid developments in technology; every aspect of software development has been affected ranging from tools, languages, composition of functionality to build applications, to the delivery of applications. Today, a comprehensive platform of new technologies has evolved, providing this revolutionary development environment. Many companies outside the software industry are aware of only small portions of this overall changing landscape; even the software industry is not aware of the full scope of all these changes and the synergistic way they have improved the ability of companies to deliver products and services faster. Virtually every area of software and hardware is undergoing rapid disruptive innovation. This is not just a concern for technology companies but even applicable to industries and any enterprise in any business. Today we are in an era where customers do not need to come to the enterprise anymore to meet their requirements. The availability of mobile devices and the use of social media have prompted enterprises to make a significant shift in direction in how they reach out to customers. Enterprises need to be proactive and find innovative ways to take their business to the customer instead of waiting for the customer to find them. They also need to be increasingly visible in the customers’ environment in the appropriate format to remain competitive. As a further step, enterprises also need to think viral. This means just creating a fantastic platform for people to use is not sufficient; the platform needs to be one that’s innovative, thereby enabling developers to create applications on top of it. This refers to the concept of creating a generative platform that lets users generate new innovations leveraging the power of the platform and becoming a part of a much bigger ecosystem. It also involves creating a platform that allows users to innovate in today’s context of connectivity, hand-held devices, and lower cost. As a company, people tend to operate within their organizations to some extent. However, the people you operate with are increasingly moving away from being internal and organizations are now becoming decomposed. Enterprises need to connect with partners, suppliers, and customers, and enable external parties to create products and services via a viral business model. To do this, the definition of an organization’s fundamentals should also ideally change from a closed, protected organization to being a much more open, extended architecture. Hence, enterprises need to extend their boundaries by ‘opening up’ the organization so other people can become a part of the enterprise. This enables enterprises to extend capabilities and leverage those that have been extended to your enterprise, reducing the need to innovate everything and encouraging enterprises to build on others’ capabilities. Eventually, this translates to extending the organization’s business opportunities and thus generating more revenue. To remain competitive and in business, enterprises need to keep pace with major developments and transitions in the technology space. Adopting and adapting to these changes is critical to stay ahead of competitors and become a successful business. To this end, they need to take some key steps from a technology perspective to get closer to customers, become a viral business, and extend boundaries. As illustrated in Figure 1, if an enterprise wants to get closer to their customers and constantly be visible in the environments these customers operate in, they would need to expose their capabilities through connected devices and applications. 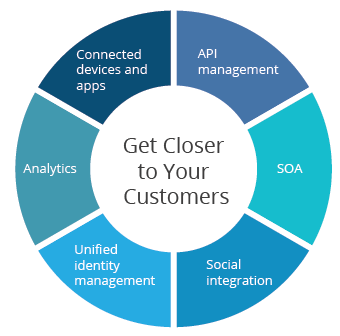 To do this, you need to have services that support and enable this, like service-oriented architecture (SOA), along with API management, social integration, and unified identity management capabilities. On top of these, you would need to add analytics capabilities to capture data on customer behavior and engagement. 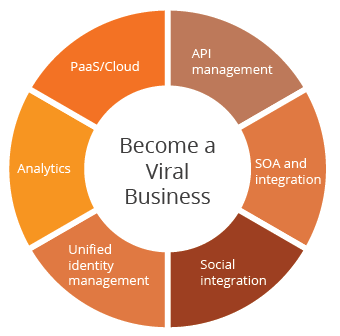 A similar set of requirements would need to be met for your enterprise to become a viral business (Figure 2); however, the composition would be slightly different because the focus would be on API management that enables users to innovate, create opportunities and ideas, and then sell these to their customers. This also refers to providing them the necessary infrastructure by way of a cloud and self-service environment that encourages self innovation. As with the previous instance, other capabilities such as identity management, social integration, and analytics too will play a key role. 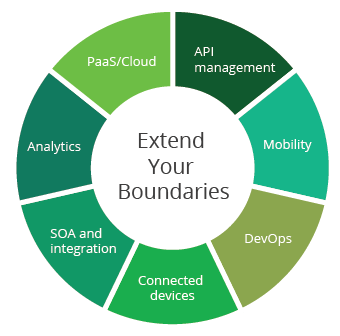 Extending your boundaries is somewhat similar to becoming a viral business; you need API management capabilities, SOA, analytics, mobility, connected devices, and devops (Figure 3) as part of enablement to encourage people to be more innovative, iterative, and agile in terms of how fast they can take an idea to market. There is a clear path an enterprise should follow to achieve these. And as a first step forward, they would need to adopt a platform - one that’s integrated with multiple capabilities. Enterprises need a connected platform to thrive in a connected world. WSO2 is the only company that has designed and built from scratch a middleware architecture platform; it’s the only company that offers a complete middleware stack that meets all your enterprise architecture requirements. It’s also the only platform available today that doesn’t consist of silos and is an integrated, connected platform that enables users to build applications. All WSO2 products and capabilities are 100% open source and built under the Apache License. Another key component in a connected world is open interoperability standards and there are many standards that drive the world and enable connectivity. In keeping pace with technology standards, WSO2 too continues to proactively participate in standards efforts and incorporate these quickly to enable smooth integration across other platforms. Integrated Architecture - WSO2 is the only company to build a complete middleware stack, built from scratch to be an integrated architecture platform. This differentiates WSO2 from large players who often build a middleware stack by piecing together separate components and marketing this as a single stack. Single-code based, connected platform - The WSO2 platform does not have silos; the platform is an integrated connected one that enables users to build applications, create value, and build user experience on top of this. Even though WSO2 offers multiple products, all of these are built on a single code; therefore, at a technical or engineering level, a single-code base translates to a single product. Varied capabilities such as integration, security, identity, API management, governance, and analytics are built into a component product known as ‘Carbon’ and all of these capabilities are marketed as different packages to meet requirements of customers who need a specific capability stack. Users can add capabilities at their own pace as the project progresses. Multiple deployment - Customers have the option to combine capabilities and re-architect capabilities on the WSO2 platform. This means WSO2 can provide customers with multiple deployment choices, on-premise and in the cloud offering a single developer experience. This is advantageous from an operational and management perspective as well because the connected platform makes its easier to carry out clustering or log analysis. The objective of any airline company is to minimize planes’ time on the ground. The WSO2 stack has the capabilities for an airplane manufacturer to build a platform that creates an ecosystem around the plane. For instance, modern planes today carry data, such as performance, and this is fed back to the manufacturer for analysis. In a connected airplane scenario, the plane can detect while in flight if a part needs to be replaced at its next destination and communicate this to the airport; the owner of the plane would then negotiate and arrange for the part to be delivered in advance, thereby reducing the time the plane would be on the ground. See how Boeing has used WSO2’s entire middleware stack to build its ‘digital airline’ platform. Connected health is a typical use case in the connected business space. For instance, if a person meets with an accident, a healthcare services provider would need to know the state of the patient’s condition, allergies, etc. when they seek treatment. Several customers today are building connected health platforms for different countries. The WSO2’s connected platform enables healthcare providers to easily build applications that help to integrate the patient to the doctor, hospital, emergency care providers, pharmacies, and insurance companies, enabling a more efficient, cost-effective healthcare service. See how Cleveland Clinic uses WSO2’s analytics platform for real-time clinical decision support and comparative analysis. This is a concept that’s become quite popular with governments aiming to create smart cities. A connected government would typically connect government institutions with citizens and organizations that operate with the government in very deep ways. This provides an efficient flow of information that is otherwise constrained by bureaucratic red tape. See how Dubai’s eGov uses WSO2 Identity Server in their efforts to build a connected government platform. A connected car does not relate to just the integration of in-vehicle entertainment; it’s about the car being connected to a number of other things, like other vehicles on the road, to your home, your calendar, an app store that enables you to incorporate more things on your car, etc. This is even more relevant today with self-drive cars; to this end, most auto manufacturers are now building some type of solution that enables them to adopt this transformation. The WSO2 platform can be used to build any connected car solution. Mercedes-Benz is one such company to use the WSO2 stack in its connected car initiative. Learn more about T-System’s Connected Car project that’s powered by WSO2 technology. Any enterprise’s long-term goal is to remain competitive and continue to grow revenue. The real challenge is to ensure people, devices, and applications are all connected, thereby creating a connected world. For enterprises to thrive in a connected world, they need to adopt a platform that’s integrated with multiple capabilities - in other words, a connected platform. Today, maintaining visibility in the customer’s environment, approaching them before they seek you, enabling a generative platform that makes way for users to innovate, and extending your capabilities and leveraging those of others have become a necessity rather than an option for business continuity. These key steps would enable enterprises to expand their businesses, increase revenue, and ensure better return on investment. Moreover, in terms of technological advancement, they would aid enterprises to make innovative strides in the industry and to stay ahead of competition. WSO2 is the only company that offers a complete middleware stack that meets all enterprise architecture requirements. All WSO2 products and capabilities are 100% open source built under the Apache License.